Want Your Boss to Invest in Your Career? Start Here. Have you been eyeing a new training course, networking opportunity, or position in your company? When you ask your company to back your career development—whether that’s through training, classes, networking, coaching, or the chance to take on a new role or responsibility—you are asking your company leaders to invest in you. Whatever you are looking to do will require time, money, and rolling the dice on your ability to provide a return on your company’s investment. Too often, we approach our careers as though our company owes us or our managers have an obligation to look out for us. This attitude stems largely from a spate of well-intentioned 1980s management books that sold the idea that good managers motivate their staff, while magically knowing how to shepherd them through their journey. I don’t know about you, but this feels weird to me. It turns our bosses and managers into strange parental surrogates. Don’t get me wrong: it’s smart for companies to invest in their talent. It makes sense for them to increase their return on the investment they make in hiring and employing people. But it’s a mistake to expect your company to manage your career growth. Even the best managers aren’t experts at managing their own careers, much less yours. And even if your managers are fully equipped to help you with your career, they’ll most likely have limited time to focus on it. The business market has changed drastically, and so have career paths, making it even harder to apply an off-the-shelf, one-size-fits-all approach to career development. So, if you’re going to be the one that drives your career growth, how do you get your boss and company to invest in you? Know what they’re already investing in. This means you have to look beyond your day-to-day and figure out what your company is up to. Sometimes this is easy to see. Your leaders or CEOs may share what their long-term goals are, what their mission is, and how and why they make major decisions. But more often than not, there is no clear strategy communicated, and you may not have access to what the C-suite is doing. That’s the plotline to every Undercover Boss episode. If you don’t have direct access, try reading your organization’s quarterly reports. If your company is publicly traded, these are pretty easy to come by. If it’s private, then just follow the money trail. What are they buying and selling? Who are they hiring? Where is the money going? Figure out how to connect what you want to do—whether that’s taking on a new project or developing a skill—to what is already a priority within the organization. Understand how your current position serves the organization.Once you have a sense of your organization’s priorities, look at how your current role, and its function, fits in. Whatever your role may be—accounting, sales, customer service, security, etc.—evaluate what your company sees as “mission critical” for that function. For security roles, your company may be focused on process consistency and sharing information. For accounting, it may be efficiencies and accurate reporting. The leaders who oversee these functions should be communicating what they want the department to concentrate on, and, if the leaders are good, where the function fits into the organization’s broader goals. Don’t be afraid to research how other groups like yours are organized in different companies. This information can help you generate ideas that help you better serve your team. Know what your leader is up to in life and in business. Though you’re an employee, your bosses are your primary customers. When you think of them in this way, you have to be curious about what their pain points are, what they care about, and what their priorities are. Here’s why thinking of them as customers is so critical: we tend to judge our leaders, but we embrace our customers. What does this mean? Well, if you view people as managers or leaders, you have all these ideas about what they’re supposed to be doing. Are they measuring up as leaders? If they are, we put them on a pedestal. We idealize them and don’t even consider how they could do better. We’re too busy letting them do all the heavy lifting when it comes to strategy and taking care of the department. If, on the other hand, we see leaders who aren’t measuring up, we focus on their flaws and dismiss the idea that we should be helping them. Sure, your work ethic may demand that you show up and do a good job, but you won’t necessarily be thinking strategically about how to get the most out of your partnership with them. All of your energy will go toward tolerating them, at best. Whether we realize it or not, most of us have expectations about what a manager at “that level” should be doing. But what if you just looked at the person? What does John care about? What are Julie’s concerns? Notice the difference? The first is focused on judging based on what we think a person in a particular role should be doing. The latter focuses on understanding the person, whether we agree with his or her choices or not. This perspective allows us to deal with reality without feeling conflicted or tuning out. Determine what you can do to support your own goalsandalign with your leaders’ interests, departmental priorities, and organizational mission. This is where you start to build a connection with your leaders. Ideally, you can brainstorm about this with your managers. They may have insight about ways to leverage your skills and passion that might not be obvious to you. Or, you may not have established a relationship with them yet, or have this kind of support. In either case, you need to show up with an idea of how you see your role evolving to benefit the company, why you’re a worthwhile investment, and how your proposal aligns with the goals of the people from whom you’re requesting time, money, or resources. Remember: no one should be working harder at developing your career than you. H.V. MacArthur brings over 20 years’ experience in helping people blaze fulfilling career paths in an ever-changing work landscape. From serving in the military to carving out her role as a coach and consultant for Fortune 500 companies, MacArthur has built her expertise from hard-fought career choices. 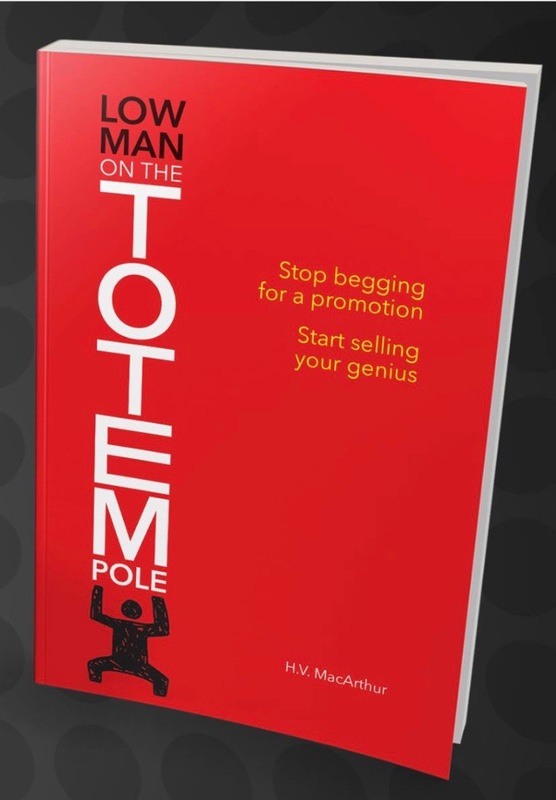 In her new book, "Low Man on the Totem Pole: Stop Begging for a Promotion, Start Selling Your Genius" (2018), she helps people from all walks of life—from C-suite leaders to employees on the factory floor—learn to identify their unique callings and find their greatness. Learn more at www.LowManOnTheTotemPole.com.